I have completed my last Knit Something of the Month project for 2012. I was originally working on the Fallberry mitts, but I wasn't loving the yarn with the pattern (more of a berries aren't this color of blue kind of thing than any fiber/knit stitch issues). 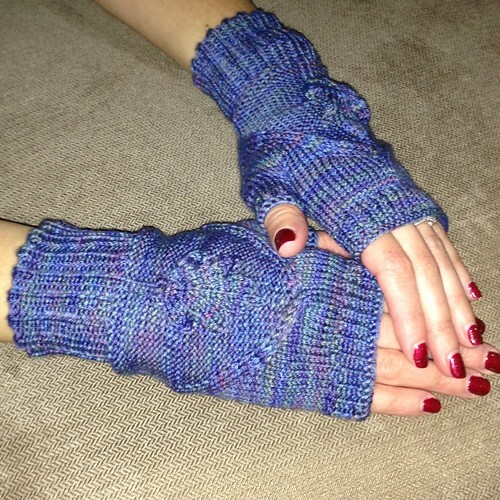 Then one day, I was wandering around Ravelry, and I came across the Oak Grove mitts and I knew they were perfect. 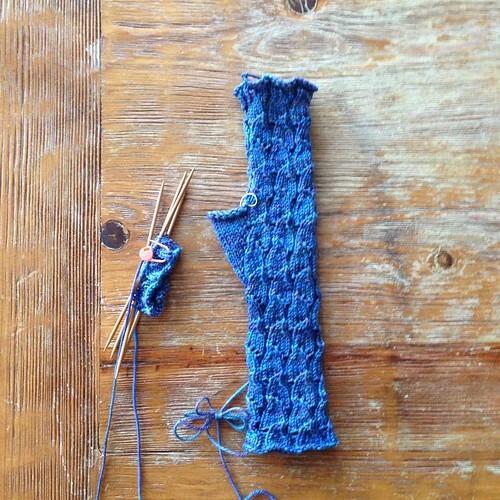 I cast on on December 23 and finished weaving in the ends on December 26. I love the little oak leaves (which show up better in real life than in this photo - check out the pattern link to see better oak leaves), and I have no idea why berries aren't blue but oak leaves are. They just are. 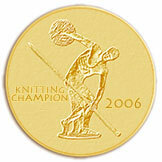 These complete 2012's Knit Something of the Month. I technically did eleven projects because I shelved August since I was doing Something That I Can't Remember But Used to Be Ravelympics and the last project of Camp Loopy at the time. Next year (can you believe it starts next week?) I will be knitting sweaters. I've planned for two months for each sweater, but I'm going to allow myself to start earlier if I want to. In other words, the first sweater will be started on January 1 and will be finished by February 28. If I get it finished before February 28, I can either start the second sweater right then, or wait until March 1. I actually matched yarn and patterns for seven sweaters this year, so if I knit faster than my original plan, I can knit more than six sweaters. The past two years of Knit Something of the Month, I haven't allowed myself to cast on early, so this will be a little change. Make sense? Now I'm off to finish the Retreating Sweater before the end of the year. Hopefully! I wanted to take a minute to wish each and every one of you a Fabulous, Wonderful, Loving, Happy, Merry Christmas! It's almost here and I know we're all going to be dashing about, finishing up last minute stuff, wrapping and shopping for the last few things we need (pie crusts and broccoli here at Chez Pink Lemon). I hope each of you has time for a little bit of quiet time too, just to enjoy the season. Thank you all for the sweet comments and well wishes for my shingles. I am doing better and the shingles are starting to heal up and go away. I think I was blessed with a fairly mild case, but I will definitely be glad to see them go. If your doctor is wanting you to get the vaccine, do it, seriously, do it. I think the vaccine is only approved for those 60 and over, but if you're in that age group just go get it. I've found that putting Tea Tree Oil on the rashes makes them feel better (I started before I was diagnosed because Tea Tree Oil has both antibacterial and antifungal properties), Caleb has learned to hug me on my left side only (my shingles are on my right ribcage area), and Mickael has redone the lyrics to this song for me - "I've got Mel with shingle, shangle, shingles..." It just goes downhill from there. Merry Christmas! I've gotten a little done on The Babette. This is part of the third quarter of it. Since it's been a while since you've last seen it, I'm sewing the blocks together into four big parts plus the center square. Then I'll join it all together and add borders. I've gotten the first two big parts done and this is about a third of the third big part - make sense? Probably not, but the point is, I'm sewing it together and maybe I'll get it done at some time before Caleb goes to college. Every time I start to sew blocks together I have to figure out how I did it for the first two sections, so it always takes me a bit to get going. Of course, if I'd just sit down and sew a little bit everyday, I wouldn't forget so I wouldn't have to figure out anything. I'm not really that organized by nature though. Who knows? It's the end of the year and I like to finish things up at this time of year, maybe I'll find the motivation to get this finished. I would like it finished after all. I love the colors and it would be nice to get it out of the middle of my sewing room floor! Right now, the only thing I'm motivated to find is more tea - there's not enough caffeine in my system yet this morning. I hope you all have a wonderful weekend! 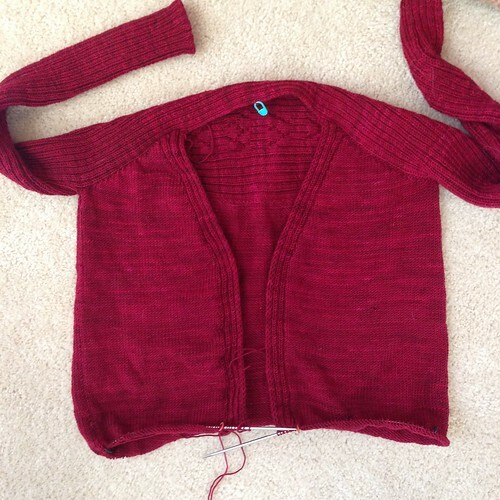 I'm still working on the Retreating Sweater and I still plan on having it finished by the end of the year! I'm only about an inch or two from having it as long as I'm wanting. (I keep trying it on to see where it's hitting me.) I'm not going to do the lower edge as the pattern has it, I'm planning on a hem. That means I don't get to quit knitting even when I hit my length because I'll have to knit enough extra for a hem. I still have plenty of yarn and I shouldn't have too much trouble getting it finished by the end of the year. The reason I'm shooting for the end of the year as a finishing goal is because I don't like having more than one sweater on the needles at a time and I'll be wanting to start my first sweater for next year's Knit Something Project. Tomorrow: maybe The Babette, maybe a gratuitous fur baby picture - who knows? Tune in to find out! I've finished my first mitt of the December project (except the thumb) and cast on for the second. 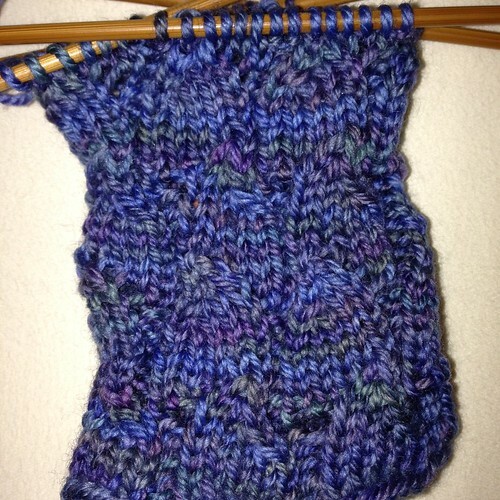 The stitch pattern is essentially based on a rib which is why the first mitt looks so skinny - it's pulling in. When it's on my arm it stretches side to side and isn't as long as it appears here. This is one of the reasons I love trying things on as I go. I can double check the fit and figure out if I need to adjust anything in the pattern to fit my particular body shape. The only change I've made to this pattern is to work one additional repeat of the stitch pattern before beginning the thumb gusset. In other news, I thought I'd give a Logan In The Car update. He's doing really well and while there are still Squeaks of Great Distress, the drool is almost completely stopped. I don't even bother with a towel anymore! As for the squeaks, Logan has always squeaked as a form of communication and probably will always squeak. It's just his thing. We're pretty used to it at this point. A few weeks ago I mentioned that next year's Knit Something of the Month situation would be sweaters and I would probably knit one every two months. I knew I had enough sweater quantities of yarn in my stash to keep me busy for a couple of years, but I wasn't sure exactly how much I had. In order to plan next year, I needed to stash dive so I could match yarn to patterns. I decided the easiest way to do this would be to put everything (at least sweater quantities of "everything" - I didn't get every single skein in the stash entered) into my Ravelry stash and go from there. I have Yarma on my iPhone so I used that to photograph and upload photos while I entered the info into Rav on my laptop - definitely the easiest way to do this. I put all my books, magazines and patterns into my library ages ago and have kept up with new additions so finding patterns I already own is just a matter of searching Rav. 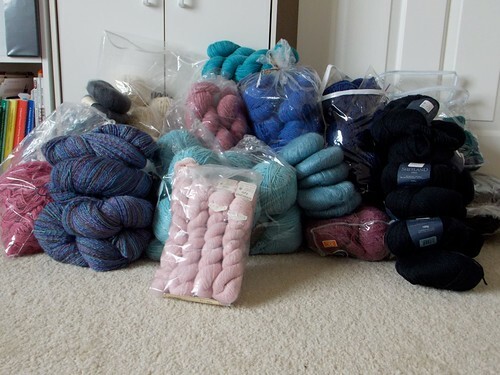 First though, I had to haul out all my sweater quantities of yarn. I know I didn't grab it all (off the top of my head I know of two sweater quantities of undyed Bugga that I didn't count and I've got a sweater's quantity of Kauni too), but I did pull out 23 sweater's worth of yarn. It's definitely time to start shopping the stash around here! I got it all photographed and entered into Ravelry as well as a couple of other one or two skeins worth of stash that could use some matching up with patterns. I sorted the sweater quantities by color, thinking it would be easier to pick things out if they were somewhat organized. (Also I figured it would be more interesting to read about my projects if they aren't all the same color - I mean my red sweater bender that I just went on was fun and all, but you guys probably want some variety around here too, right?) I'm also loosely thinking about yarn weight and timing - no one wants to be sitting under heavy weight yarn in July in Texas, except maybe Max. I'm also going to shop my stash for patterns as much as I can. I've got over 6000 patterns (crazy!) according to my Ravelry library. Surely I can find things to match with 6 different yarns. (I'll definitely match patterns for the 6 sweaters I need for 2013, but I might match a few more too - stash diving has made me want to KNIT IT ALL, so if I have time, I might try for a couple more this year!) Of course, I've discovered in doing this the last two years that I also need to give myself the freedom to change my mind - on either pattern or yarn or both. My plan, my rules, right? Fridays are for FINISHED Crochet! Yes, it is finished! I've trimmed the ends, it's been inspected and approved by the Department of Crochet Inspection and it's ready to wrap. 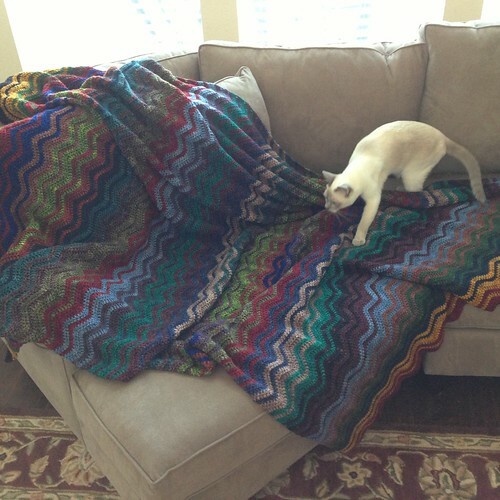 The blanket is wonderfully soft and drapey and I couldn't be more happy with it. The finished size is 58 inches wide by 80 inches long - big enough for the recipient to use even when he's all grown up. I used 19 skeins of Madelinetosh Tosh DK in 18 colors (I used two skeins of Tart because red is the recipient's favorite color). Each color was used twice with only a little bit left over. My starting chain was 213 chain things long. All the details, including hook size and colors are on my Ravelry project page. (I just found out how to make project pages accessible to non-Ravelers, so even if you aren't a member, feel free to click!) It feels good to have this rather huge project all finished up. Maybe I should get back to work on The Babette now? I hope you all have a wonderful weekend and I hope your Christmas projects are going quickly! Once upon a time, there was a Pink Lemon. When the Pink Lemon was in college, she did a lot of sewing. You see, the Pink Lemon was briefly an Interior Design major and one of the classes she had to take was a basic sewing class. The Pink Lemon had been sewing and crafting all her life, but this basic sewing class really got her hooked on the sewing again. 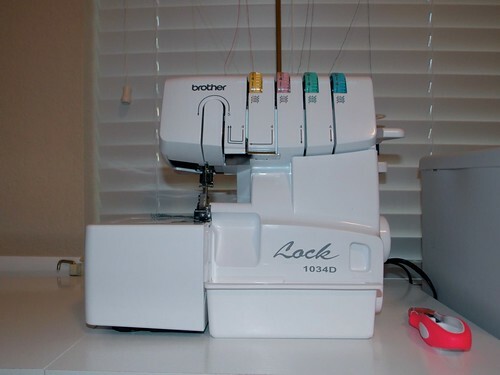 One Christmas the Pink Lemon's Mother gifted her with a serger. It was a lovely serger and could do many things. Unfortunately, the serger was cursed by an evil something or other. It would pretend to be serging properly and then start spitting thread out randomly, mid-seam. It would be rethreaded, oiled, cleaned and talked to nicely by the Pink Lemon. It would pretend to be behaving and then it would act up again. It was very frustrating to the Pink Lemon. She took the serger to several repairmen. They cleaned it, checked the timing, checked all the innards of the serger and pronounced it a lovely serger. The Pink Lemon would take it home and it would spit thread at her. Sewing machine repairmen do not cure cursed sergers. The Pink Lemon only used the serger when she had to. She learned to do French Seams, Flat Felled Seams and Hong Kong Finishing in order to avoid the serger. When she had to use the serger she made sure she had several hours to work with it and never ever tried to use it when she had a deadline. Mostly, she quilted because quilting doesn't use sergers. She got very good at avoiding the serger. After years of dealing with the serger, she also knew (sort of) how to get it to work when she absolutely HAD to have something serged. It always involved a great battle though between the Pink Lemon and cursed serger and it wasn't very fun for anyone involved. The serger worked just enough to warrant keeping it. It was a very frustrating time in the land. Then one day, it happened: the serger broke! It broke right in the middle of a project that the Pink Lemon was trying to make. Do you know what the Pink Lemon did? Did she cry? Did she throw herself on the ground, weeping at the injustice of it all? Did she shake her fist at the sky and curse sergers everywhere? No. She did not. She made sure the damn thing was dead and then she did a happy dance. She did a happy dance with Maximus and she did a happy dance with Logan. She did a happy dance in front of Caleb and Mickael who told her to move because they were trying to play Call of Duty and she was blocking the TV. They did not understand the depths of her happy dance. She ignored them and continued dancing. Then she took the serger, the cause of so much frustration and so many problems for years and years, and she chunked it into the garbage (because curses shouldn't be recycled). That night she slept well, knowing that the serger would no longer thwart her creative ambitions. There was peace in the sewing room. But there was a problem. Sergers, properly working, uncursed sergers are very useful in sewing and produce a professional seam finish with minimal bulk. The Pink Lemon realized she needed a new serger. She googled serger reviews. She read sewing blogs. She didn't want anything fancy, no 5 thread, jet air threading, computerized King of the Sergers kind of serger. She just wanted a reliable, basic serger that didn't cost too much. She found one. She brought it home. She talked to it nicely through the box. Max welcomed it to the family by rubbing on the box and purring. He gave the corner of the box a love nibble. Logan welcomed it to the family by giving it kisses and lots of sniffs. Mickael and Caleb said, "Great, now get it upstairs to the sewing room. It doesn't go in the entryway." The Pink Lemon didn't want to rush this new serger relationship. She didn't want to pressure the serger. They were taking it nice and slow. Eventually it did get upstairs to the sewing room, where it was slowly and lovingly unpacked. The Pink Lemon played music for it (sergers like AC/DC). The Pink Lemon read all of its directions. The Pink Lemon and the serger were very happy together. The Pink Lemon also signed up for a beginning serger class through Craftsy so she could learn all about the wonderful things the new serger does. Since her first serger was cursed, the Pink Lemon never ventured beyond the Four Thread Overlock stitch. Now the Pink Lemon dreams of rolled hems, ruffles and flatlocking! She is only partway through Lesson 3 and she and her new serger are planning many years of sewing happily ever after. Late yesterday my parents had to make the decision to put their little Sheltie, Barclay, to sleep. I've blogged about Barclay here before and he's spent time at out house - several weeks when my parents moved to Texas three years ago and then a few weeks again at the first of this year when my parents needed to go out of town. He was always a perfect house guest and he and Finn became good friends immediately. He and Logan took a little more time to get to know each other, but they finally settled into a friendship as well. He loved cats and yes, he tried to herd them. Many times. It worked about as good as herding cats ever works. He walked miles and miles around the neighborhood with my dad. Being small, fluffy and friendly, he met and was loved by all the kids in the neighborhood. He loved to swipe things from the kitchen table. Baked goods were a favorite and he once ate half of a pound cake - it wasn't a diet pound cake either. I don't know how many loaves of bread the little guy put away when my parents forgot to get them off the table. He was a loving and friendly dog to everyone, but he was always Daddy's dog. He'd follow Daddy all over the house, jump into Daddy's lap when he sat down, and sleep next to Daddy on the bed. The picture above is a walk that I took Finn and Barclay on together. Finn always liked to sit on this particular rock partway through the walk. 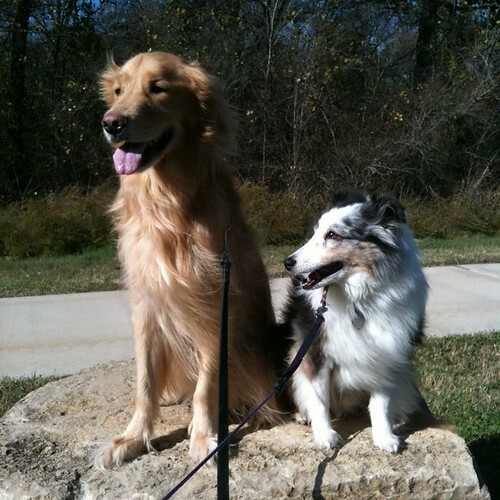 I had to lift Barclay up there, but he seemed happy to share Finn's rock that afternoon. Somewhere in Heaven, if there's a rock that's the right size and shape, I'm sure Finn and Barclay are sitting on it, enjoying the sunshine. When we moved into this house, almost four years ago, there was wallpaper in the kitchen and breakfast area. It was not the worst wallpaper I've ever seen, and was not giving me nightmares or anything, but in general, we're not fans of wallpaper and it really wasn't us. We planned on having the walls textured and painted but we weren't entirely sure what color we wanted. We thought, we got a couple of colors and tried them out, but we hadn't found the right color yet. We just ignored the wallpaper and lived with it and let the paint color idea bounce around in our heads. Finally, it hit me - a robin's egg blue! It would work with the rich browns of the cabinets, it would work with the colors in the granite countertops, and it would work with the chickens and red accessories I use in the kitchen. I picked out a color, got a sample, painted some of it on the wall and knew I had the color. 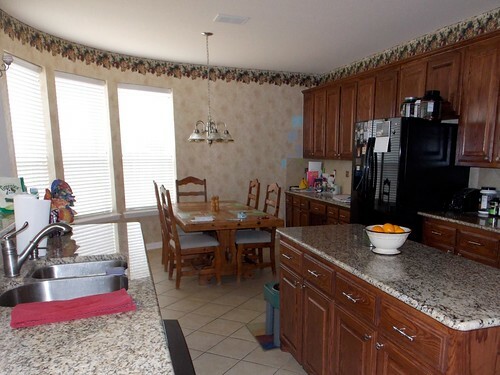 (If you look at the large wall space to the right of the windows, by the cabinets, you can see our patches of different colors - the one we chose is the bright one.) Mickael and Caleb gave it the OK so last week we had the wallpaper sealed (it was applied by the builder - napalm isn't taking this stuff off, but if you don't seal it, it could be a problem later), the walls were textured and the new paint was applied. The color is a pale robin's egg blue, with a hint of green, that walked by the color gray. Valspar calls it Harbor Mist. I love how much brighter and happier the kitchen is now. I want to get a teacup rack or two (maybe three?) for the wall space by the windows and put my teacups in it and I'm thinking about sewing some valences for the windows - something with some red in it. Max is happily running along the cabinet tops again and doesn't seem to miss the grapes at all. Logan's cave has a bright, happy back wall now (his cave is actually a knee hole for my workspace, but good luck getting your knees in there - Logan takes up all the space). 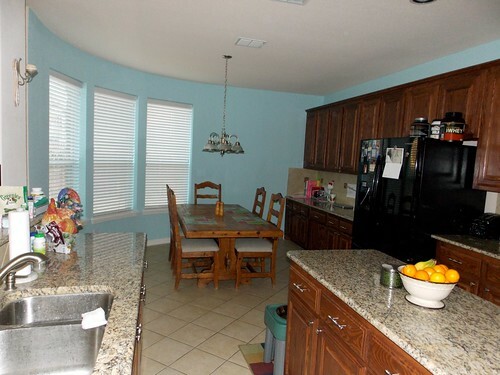 I love the new color - it just makes the kitchen so much more us! This is the last Knit Something of the Month project for 2012! I'm not sure how we're already in December - it doesn't seem like that long ago it was January. For this month's project, I'm knitting a pair of Fallberry Mitts in Dream in Color's Smooshy With Cashmere (yum) in Dusky Aurora. I'm doing the smallest size. 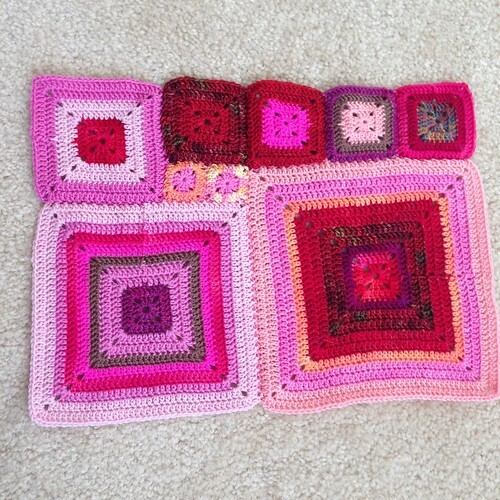 The stitch pattern is easy, the yarn is wonderful and I love the colors. It's a little dark in the photo so next time I blog these, I'll try to get a more accurate picture of the color.